Jake McCandles would be my second pick, but my top one isn’t on your list: Sean Thornton from The Quiet Man. And surprisingly, you don’t have Ethan Edwards from The Searchers, which would be my number three. I had to discard Ethan Edwards with Joe January and Matt Masters. Too superhero alter ego sounding. I didn’t list Sean because John Wayne doesn’t strike me as a Sean. Well … Sean is just John in a Celtic variation. I know. 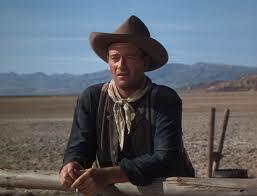 I still can’t watch John Wayne and think Sean. We make a lot of “young Sean Thornton” jokes. We visited the places where that movie was filmed in Ireland. It gave us a much better understanding of the unreality created by editing! I’ve always wanted to go to Ireland. Hopefully, I’ll make it over there. My all time favorite name is Rooster Cogburn! Rooster is a good one, and I almost put it on there. Ringo Kid might have been in there but that would be too close to Jimmy Ringo played by Gregory Peck in the Gunfighter. I have never understood why there are so many Ringo’s in westerns. I guess Rooster was left out because it is more of a nickname. Even Reuben J Cogburn is a good name. Do you think the J might be for John? It could stand for John. Honestly, I didn’t consider Reuben because I was stuck on Rooster. When you explained #9, I understood the lure of the name Taw, a word that wasn’t in my vocabulary. For my dad, who was young growing up as a poor kid born in 1933 here in Tennessee in Jackson County near Defeated Creek, the sparkle and rarity of marbles held a draw about like video games do for young folks today. Game competitions with marbles had skilled players almost as talented as pool sharks did who competed at billiards. His trajectory skills in marbles and later hunting and marksmanship skills behind a gun do enlighten me to the “draw” of that name. I have heard a lot about marbles from my dad and my grandfather. It was almost like collecting baseball cards through skill. From what I understand, you got to keep the marbles that you knocked out. Perhaps we should go back to marbles. It was definitely a more social game than something on a screen. The War Wagon is one of my favorite movies… nice post. Thanks. It’s a good one with an interesting ending. Hondo Lane, Kirby York(e),and my favorite,Quirt Evans. Quirt Evans is a great one. Well, there’s Breck Coleman from “The Big Trail”, but I guess that’s reminiscent of a Breck Girl. However, in “Pittsburgh”, though his name is Charles, everyone called him Pittsburgh Markham. That’s pretty tough, taking on the name of a steel town. There were several geographic character named in John Wayne movies (i.e. Colorado, Mississippi). However, I didn’t know he had one, too.